WOW! :O :O :O Masha'Allah! 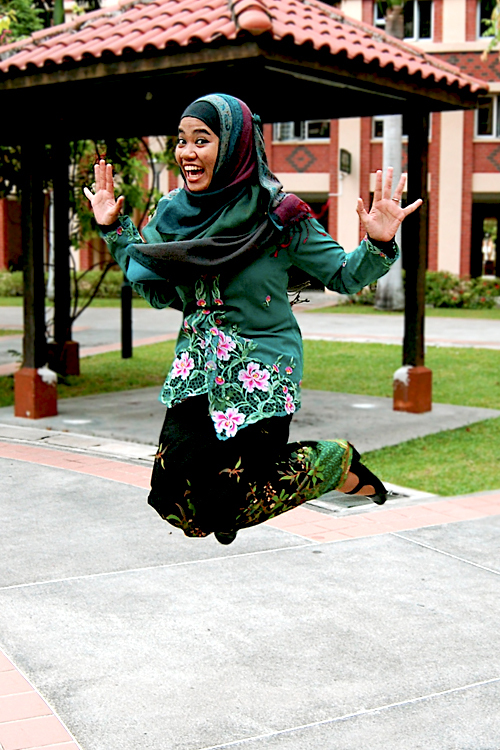 lol, an energetic sister in beautiful traditional clothes. Absolutely gorgeous outfit too - amazing colour combination! What a lively and joyful photo... this is the Islam I know and love! This pic is adorable. The Sister looks like she was having a great time. Yes, the jumping photo! She's beautiful! I am married to a Singaporean Muslim, we live in Denver, Colorado, USA and she has always worn her head covering. How proud I am to be married to a woman who love Allah (swt). One of best photos in this blog. Congratulations, really good shot! Fun picture and a beautiful girl. I'm not a Muslim woman, just one who is interested in the lives of other women, but it is this woman that I wish everyone who is not a Muslim could see. She is so clearly having a wonderful time and she makes me smile everytime I see her. I would love other people to see her and feel more peace with each other and the world. The non-Muslim world so rarely sees hijabis in a light like this, and it would do them a world of good to do so. You are doing beautiful work on this blog!